FIGHT THE FIGHT WITH LORALEE! 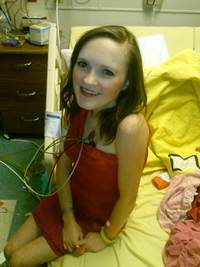 Loralee Mills needs a heart transplant and needs your help. If there is one word that describes my wife, Loralee Mills, it would be FIGHTER. Why, you ask? Lora has had to fight her entire life with a congenital heart defect called Tricuspid Atresia. This defect sounds complicated, right? In short, she was born without the chamber in the heart that pumps oxygen through the blood, which of course, is critical. But, I still haven’t told you why Lora is a FIGHTER, have I? Well, according to the doctors in 1979 she was not going to live past a few hours… um, yeah right… FIGHTER. If you were to ask Lora how many times she’s lain on an operating table or hospital bed about to be pronounced dead she would say sheâ€™s lost count. Lora is a truly giving and strong person. Though she has always been told that she can never have kids, that hasn’t stopped her from being a foster mom. It has gotten to the point that doing something like a load of laundry makes her feel like she just walked five miles. I have told her millions of times to relax and not overdo herself, but she continues to fight as if she has a normal heart. Lora desperately needs a heart transplant in order to survive. At this moment, she is in the hospital waiting for the gift of life. Transplants are life-saving but incredibly expensive. Relocating to be near Shands Hospital in Gainesville for many months and life-long anti-rejection medications are two of the several large expenses we are facing. To help with this financial burden, a fundraising campaign in Loraleeâ€™s honor has been established with HelpHOPELive, a nonprofit organization that has been assisting the transplant community for 30 years. All donations are tax-deductible, are held by HelpHOPELive in the Southeast Heart Transplant Fund, and are administered by HelpHOPELive for transplant-related expenses only. Please consider making a donation. Hey, this is Lora. The 1-year anniversary of me being in the hospital waiting for my new heart is coming up shortly. The days are getting longer and the wait is getting harder. I know that God is preparing the perfect heart for me and I know it will come at the perfect time. I’d like to thank everyone that has supported me financially and through your prayers, cards, and well wishes. We still have a long way to go to reach our goal monetarily, but we CAN reach our goal with your help. Donating, sharing through social media, and taking the time to put together a fundraiser through HelpHOPELive are some of the things you can do to help me. HelpHOPELive is more than happy to help in any efforts you are willing to do for me (just ask Rebecca). To all my fellow #heartgangstas out there… just follow God. Today is Monday, October 27, 2014. I think you are coming home to Lakeland. What a long journey of ups and downs. You are so strong in spirit and such a wonderful role model for us all. I love your smiles through your struggles. I love your heart!!! Can't wait to see you again and give you hugs!!! Hey sweet lady! You are a few hours post transplant and my new hero! I do not know you personally but have been following you since the beginning and am so overjoyed at your new chance you have been given! Keep getting stronger and in no time you will be out enjoying the things you have miussed for the past year or so...Can't wait to see your smile again! Hey Lora!! As you probably already know I had a quadruple heart bypass June 11, 2013. So I very much know how you feel. However I did not have to stay in the hospital as long as you have. Please know I'm always praying for you!! Love you!! Praying your heart comes soon. My daughter is 31 and also has tricupid atresia. Loralee you are awesome!!! And you truly are such an inspiration to everyone! Loralee - This is from Camden's grandma and grandpa. We really appreciate the video you did for our little guy. We are praying for you and hoping that everything works out for you. she is nothing short of a god sent angel. i love you lora and hang in there, after all this god has great things in store for you he just has too! we love you so much. Love that picture of you! Good job, Mike. You are a fighter, Lora! Darn. No picture upload. No toilet. Bummer.